Contest for coming up with the most creative, off-label and interesting use for the pulse transformers donated by Hack42. In their infinite wisdom, Hack42 in Arnhem sent us a whole reel of old 10base-T Pulse Transformers. 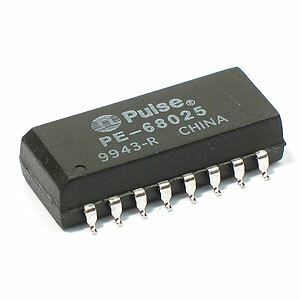 The exact model we received is the PE-68025, and there are many, many, many of them for us to play with. While discussing this with Benadski, he had the awesome idea of setting up a contest to see who could come up with the most novel and interesting way of using these suckers, in a way they were most certainly not designed for. If there is sufficient interest, I think this could be a really fun project. To be determined: A prize. Preferably something silly and insubstantial. Rules: None that I can come up with, other than 'anything involving moving electrons and the aforementioned pulse transformer'. End goal: Whichever entry wins the contest, we will box that sucker up and send it back whence it came at year's end? I already put some signals through one of these with a function generator. As you can see in the datasheet, there is an internal low pass filter in series with the inputs, so you're stuck with those. It passed frequencies up to around 18-20 MHz just fine, but after that the dropoff is steep. On the other end, sine waves are heavily distorted and attenuated under a few hundred KHz. Build a joule thief out of it, the inductance seems about right. Build a simple POE (power over Ethernet) contraption, so you can power and control a remote Ethernet device (a raspberry PI). Just inject +9Volt on one end, and connect a low drop 9V to 5V regulator at the other end. As these are 10-baseT transformers, they might not pass 100-baseT signals well, but the Ethernet controller should automagically switch to 10-BaseT, and the remaining connection might still be useful. This page was last modified on 17 January 2017, at 18:04.